Many older people resort to memory supplements or brain supplements, hoping these will restore their memory function. However, memory failure is not confined to the elderly. It may be a symptom of vitamin deficiency, alcohol, or drug abuse or even the onset of Alzheimer's disease. In addition to being a cause for health worries, the condition can make life quite difficult and is just plain embarrassing. Health food stores are full of memory supplements containing herbal ingredients like ginkgo, ginseng, water hyssop, and periwinkle, all claiming to be able to improve memory performance. In addition, research suggests that taking vitamins may also be an excellent way of improving memory or retarding memory decline as you age. Every month seems to bring a new wonder drug, memory pill or brain booster in the herbal cures area, and some of these have been studied, and they appear to have some effect. Ginkgo biloba, for example, has been found to increase blood circulation in the brain. However, claims are made for many herbal supplements without any real evidence that they do any good. Anti-oxidant vitamins that have a retarding effect on the aging process, as vitamin A, vitamin C and vitamin E, can help keep brain and memory function at an optimal level. They may also help increase the blood circulation to the brain, ensuring a good oxygen supply for maximum performance. Sometimes it is possible to buy all-in-one memory supplements to avoid having to purchase and swallow many different kinds of pills. 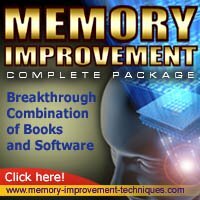 However, anyone considering buying memory supplements should read first and be aware of what they are taking, along with any possible side effects. Consulting your doctor is always important, as memory failure may be a symptom of an underlying health problem that he could treat. Additionally, some supplements can interact with other medications. In addition to taking memory vitamins and supplements, small lifestyle changes may also benefit the mind and memory. The diet should be as healthy as possible, with plenty of fresh vegetables, fruit and oily fish, and very little alcohol. Exercise is excellent for the brain, sending oxygenated blood and nutrients to the head and generally improving function. In addition, the brain enjoys and benefits from mental exercise, such as crossword puzzles, Sudoku, chess, and quizzes. Strategies such as writing down all reminders in a small notebook or on a wallboard can also help with life's day-to-day memory problems. Brain Supplements: Can they help?